Dr. Sanjeev Gulati has special expertise in managing kidney transplants and renal diseases in children. Dr. Sanjeev Gulati played a pivotal role in the Dialysis and Transplant programme at SGPGI, Lucknow which is amongst the largest programmes in the country. Dr Gulati has also written a book on “Childhood Renal Diseases”. He has received several awards for his original contributions to the field of kidney diseases. 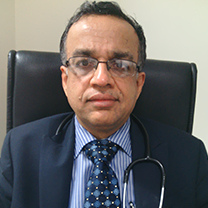 His work has received recognition from the Indian Council of Medical Research, Indian Academy of Pediatrics, Indian Society of Nephrology, the Australian College of Pediatrics, Royal college of Pediatrics and Child Health UK Royal College of Physicians and Surgeons of Canada and the Japanese Society of Nephrology. He is the Vice President of Indian Society of Organ Transplantation and Member Governing Body Indian Society of Nephrology. Nephrology. Fortis Flt. Lt. Rajan Dhall Hospital, Vasant Kunj. Dr. Sanjeev Gulati is one of the best Nephrologists in Delhi with 25 years of experience in this field. He is one of the leading Nephrologists in Delhi. Dr. Sanjeev has worked at leading hospitals in the UK, Australia and Canada where he gained immense expertise in this field. Best Abstract award, Asian Pacific Congress of Nephrology, Kuala Lampur - 2008. Best paper award in Clinical Nephrology at the Annual Conference of Indian Society of Nephrology, New Delhi - 2008. Best Poster award in Clinical Nephrology 33rd National Conference of the Indian Society of Nephrology - 2002. ISN NKF scholarship, Satellite meeting of the World Congress of nephrology, Singapore - 2005. MBBS - University of Delhi, 1985. MD - Pediatrics - Post Graduate Institute of Medical Education and Research, 1989. DNB - Pediatrics - Obstetrics & Gynecology - National Board of Examinations, New Delhi, 1991. DM - Nephrology - Sanjay Gandhi Post Graduate INstitute of Medical Sciences, Lucknow, 1994.